You will wake from your surgery with your arm in a disposable sling and a large pad on the shoulder. As part of the surgery, water will have been injected into your shoulder. Some of this fluid will seep out over the next twelve hours. You may have been given a nerve block by the anaesthetist. This will make your arm feel dead for between twelve and twenty hours. This stops you feeling any pain but your arm will be completely dead until it wakes up. It will wake up from the fingers first, slowly coming back to life up the arm. When this happens you will also start to feel some pain and you should ask for painkillers early on from the nursing staff, or if you are at home, take some at that pont. The morning after your surgery, all the dressings should be removed. Replace the little postage stamp plasters placed over the keyhole incisions. It is perfectly safe to go in a shower and to wash the skin with soap and water. It is perfectly all right to get the keyhole incisions wet although it is not advised to soak them in a bath. After three days the keyholes will be healed and they can be covered with the little plasters or left open. You will be seen approximately a week after the surgery when Mr Kurer will check your movement and the wounds. The main aim in the days following the surgery is to stop the shoulder getting stiff. You should attempt the exercises shown here. 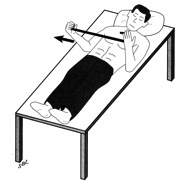 The operated shoulder is stretched by the other arm. 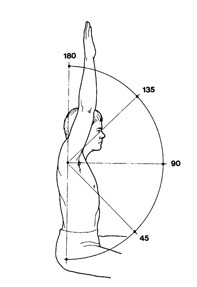 It is not necessary to actively elevate the arm, just use the other arm to try to keep it moving in all normal directions. When you see Mr Kurer a week after the surgery he will advise on further stretching and strengthening exercises. If you notice marked redness or discharge from the incisions or severe pain, then you should telephone Mr Kurer’s secretary during office hours on 01209 891434, or at other times the King’s Oak or Garden Hospitals.